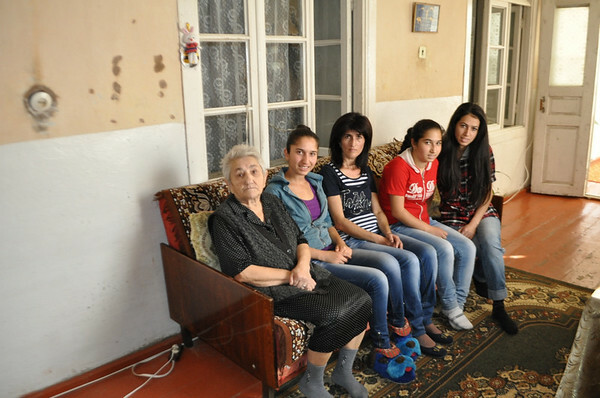 Arshaluys and Anna Hovhannisyan, both CASP beneficiaries, were born and raised in the city of Meghri. Considered the southern gate of Armenia, Meghri borders Iran and has a soft and warm climate. Here, the fruitful gardens are sweeter than honey. Still, the Hovhannisyan family struggles to make ends meet. As a single mother, Anahit Hovhannisyan works as a cleaner at Meghri State College and earns 45,000 AMD, or 110 USD per month. In addition, the family income is supplemented by the 40,000 AMD a month pension Anahit’s mother-in-law Alvard receives. This, combined with the family’s 27,000 AMD state allowance, covers their most basic expenses. In addition, the eldest sister Alvard graduated from Kapan State College’s Faculty of Pharmaceuticals in 2011, but is still looking for work as there are no job opportunities. CASP helps this family get by with additional help with expenses like heating and school clothes. Arshaluys is in the 12th grade at Meghri #2 School and Anna is in the 9th grade. Both study hard and dream of attending university. Arshaluys wants to become an economist and Anna wants to become a teacher. Arshaluys studies German at school. This year she received the school’s Student of the Year Award and had the opportunity to attend English language courses at the American Embassy in Armenia. In addition to her classes, Anna does community service as a member of the school’s student committee and actively participates in events organized by the school and the city. She also enjoys playing chess and won the Syunik Chess Championship in both 2011 and 2012.